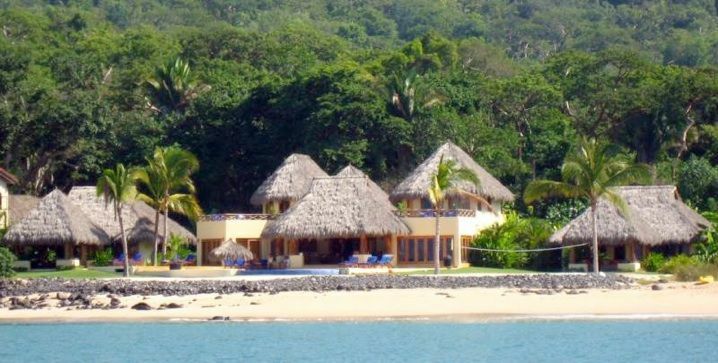 If you are planning a family reunion with up to 18 people, Las Palapas is a dream come true! Just completed in 2007, this home is located on a one acre parcel with 200 feet of spectacular ocean frontage in one of the most beautiful coves in Mexico. All 7 bedrooms have baths and tremendous ocean and beach views. Impeccably decorated and comfortably furnished in an absolutely gorgeous setting. There are tons of activities and our staff of four will make sure you have an incredible and memorable time. They will cook 3 meals a day and provide tasty appetizers and drinks. Labor included. Budget $25 per person per day extra for food, beverages, and alcohol. You wont have to lift a finger! The owners rent this home only 10 weeks per year. This is a shot of my favorite thing to do ! Surf ! Linda and I love Las Palapas! It is such a gorgeous cove. When not there we live in Northern California between San Francisco and San Jose in a small town called Ladera which is right next to Stanford University. Linda spends a lot of time raising money for the local high school and tutoring English. I spend my time investing and surfing. PS this surf shot is not Mexico, but certainly could be. Chacala is a really special spot. The cove of Chacalilla is so beautiful. There is fantastic surfing near by. I kept passing it by boat and thought if I owned a home here I would be home already ! I also really wanted to build a home with lots of palapa roofs. Our brother in law did a fantastic job with the architecture and the home is really livable. We designed it with family reunions in mind. There is so much to do ! From pool volley ball to tennis, snorkeling, fishing, surfing, hiking and tons more. Be sure to check the activities page at Las Palapas dot tv. There are two kitchens No Service on Sundays. Budget $25 per person per day for food and beverage. Budget $25 per person per day for food & beverages. Labor for 3 meals appetizers and drinks included in rental. Two dinning room tables one in the dinning room, one in the main palapa. 2 kayaks and 2 stand up paddle boards and 10 surfboards and 5 boogie boards. 6 sets of masks and snorkels. 2 half days on mexican fishing boat provided free. Please tip $40 each trip. We have 4 cheap rackets. Bring balls since ours may be used. What a wonderful place to experience a family vacation! The location is ideal, right on the bay, and steps from the beach. It truly felt like a holiday with Paul, Nydia and their staff taking care of our every need, from making delicious meals and drinks, cleaning, and arranging the whale watching boat tours. Thank you to Bert for providing this amazing home for our family to be together! Beautiful site, excellent staff, everything is well thought out from the abundance of "toys" (snorkel gear, paddle boards, puzzles, Jenga, sand toys...) to the furnishings and property layout. Well done, Bert! I hosted an intimate yoga retreat at this beautiful private estate. The sky gazing is breathtaking and the food delicious and wholesome. The staff is friendly and kind. Looking forward to coming back! Thank you! Once again we had a memorable trip to Las Palapas... the setting, the food , the activities... wonderful. The place is perfect and magical. We had the greatest time at this property with our family. Thank you to Paul and Nidia and the whole staff. They were incredible!! The food was amazing, the view was incredible, and we loved spending time in the warm ocean and pool. Thank you for sharing this beautiful property with us!! Outstanding and ready to go again! This was my 2nd time and Nydia,Paul and team make you feel at home. It’s paradise! We include 2 half days of boating per week for fishing, surfing, boogie boarding, snorkeling (which you can do directly in front of the property) There are 2 tennis courts in the gated community, paddle ball, walks, we have many games including beach golf, croquet, badminton, volley ball, horse shoes, etc. Budget $25 per person per day for food and beverages. No Sunday Service or Christmas Day or New Years Day. Check in time is 3 pm. Check out time is 11 am. Please tip Nydia our property manager $400 for the week. She will distribute tips. Please give Nydia $400 to $600 your first day so she can replenish groceries and beverages. She will show you receipts during the week. She will show you a bill for final check out food and beverage. She takes dollars or pesos. Event dates are nights. You check out the next day.